DENVER – A bystander who was shot and paralyzed last February while a task force in Colorado Springs tried to arrest an auto theft suspect – who ended up shooting three officers , killing one of them – is suing the agencies and officers that comprised the task force and the estate of the fallen deputy, claiming the officers disregarded protocols that should have prevented the man from being shot. In a lawsuit filed on Feb. 1 in U.S. District Court for Colorado, the bystander, Thomas Villanueva, claims that officers and deputies from the El Paso County Sheriff’s Office, Colorado Springs Police Department and Colorado State Patrol failed to properly identify themselves as they tried to arrest an auto theft suspect they had been following for much of the morning. The suit was first reported by The Denver Post. The suit names as defendants El Paso County, Sheriff Bill Elder, Colorado Springs, its police chief, Peter Carey, CSP Sgt. 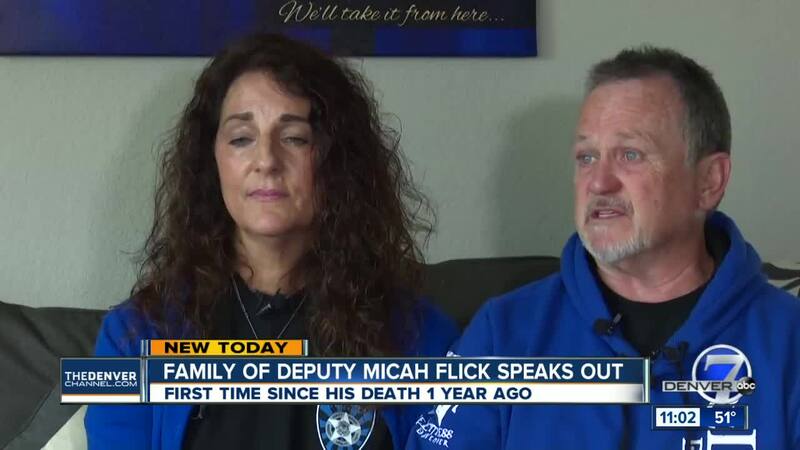 Chad Hunt, nine other officers from the departments and the estate of Micah Flick, the deputy who died after he was shot by the auto theft suspect on Feb. 5 of last year. The suit was filed on the eve of the one-year anniversary of the incident. Flick’s parents told Denver7 this week they were still having trouble recounting the day their son died but thanked the community that has rallied around them. According to the suit and some details Denver7 has learned about the incident that day over the past year, the various officers were part of the Beat Auto Theft Through Law Enforcement (BATTLE) task force and were tracking a stolen Saturn sedan that was being driven by Manuel “Grumpy” Zetina, a member of the South Side Soldados gang. They had followed him around Colorado Springs in unmarked vehicles through much of the day before deciding to execute a “takedown” on him at the Murray Hill Apartment complex around 3:30 p.m. that day after he got out of his vehicle and went inside an apartment. According to the lawsuit, none of the officers who took part in the task force and attempted takedown that day were in unmarked vehicles and were not displaying their identifications – though task force policy says that at least one of the officers involved in a takedown needed to have proper police identification showing. The suit says that the task force was aware that Zetina was a gang member and that he could be armed. Villanueva was walking back to his apartment from buying sandwiches that afternoon when the task force officers decided to confront Zetina as he walked out of an apartment, according to the suit. The suit says that one of the deputies told the team that Zetina could have a weapon inside the hoodie he was wearing because of the angle of his arm, but that some of the officers, including Deputy Flick, approached him and tried to take him into custody. The suit says that protocol should have led the officers to tell Villanueva they were officers and that they were about to arrest a suspect – thus allowing him to avoid any potential danger. But it says they failed to do so, and when Zetina pulled out a gun as Flick and another deputy tried to “bear hug” him, Villanueva was shot, along with Flick and two other deputies, before one of the deputies shot and killed Zetina as well. According to the lawsuit, the task force’s alleged failure to ever identify themselves as officers went against protocol and may have endangered themselves – in addition to not allowing Villanueva to get out of the area before the confrontation. The suit states that “multiple civilians” could not tell the task force members were undercover officers. “Residents in the Murray Hill Apartments complex, who observed the entire chain of events, believed that a gang fight was happening in the parking lot. They did not know the BATTLE Defendants were members of law enforcement,” the suit says. It also details that a woman living at the apartment complex walked out of her apartment armed with a gun after the shootout between officers and Zetina “because she did not know they were police” and she was concerned about the gunfire in her parking lot. The suit claims that the effects of the injury have been personally devastating for Villanueva and have led him to contemplate suicide. It says he has had to move back in with his parents, lost his job because he can’t work, and has lost contact with friends because of the changes in his life. The suit also says he can no longer skateboard like he used to like to do, cannot have an emotional relationship and will need home care for the rest of his life. The suit alleges two violations of the U.S. Code relating to “state created danger” and “failure to train” against some of the law enforcement officers, as well as “willful and wanton negligence” against all the defendants and “vicarious liability and respondeat superior” against the sheriff’s office and police department. Villanueva’s Wheat Ridge and Houston, Texas-based attorneys have requested a jury trial and are seeking compensatory and punitive damages. The Colorado Springs Police Department did not respond to a request for comment Monday and El Paso County Sheriff’s Office spokesperson Jacqueline Kirby said the office does not comment on pending litigation.